DT is altering the food chain! Is your ecosystem adapting fast enough? Listen to real-world examples of how some companies are evolving and transforming at an incredible rate fueled by technologies that didn’t even exist a short while ago. No sector or industry is immune or future proofed from what’s about to follow. Traditional big business and institutions are at risk of being displaced, becoming obsolete or made irrelevant. 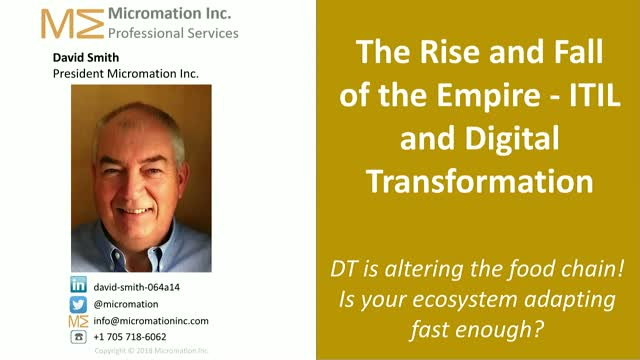 The pace of change is accelerating exponentially; are you adapting fast enough? What if - there was a new service management model that could help you tap into and leverage your current investments, methods and human capital to adapt more quickly. What if - this new service management model was self-organizing, just-in-time, low entry cost, flexible and elastic? What if - this new service management model inspired innovation, creativity and outside the box thinking? This session is about how to optimize and transform IT Service Management in the digital age. *How ITSM is evolving to manage services in the digital age. Three (3) Week Cycle Method. Cyber-attacks worldwide cost businesses more than $400B annually. Studies predict that number could climb to $2.1T by 2019. Leading cause of breaches include apps being downloaded without approval, unmanaged devices being used within the corporate network, poor password protection, error-prone manual processes and many more. Today, organizations are faced with lengthy processes to identify, prioritize and remediate security vulnerabilities, which ultimately can cost organizations not only millions in dollars but irreparable damage to their company brand. Learn how leading companies expose risk, minimize attack surfaces, and generally improve the overall security posture. DevOps! Curse or Cure for DT’s insatiable need for speed? Many predict mass extinction of traditional jobs as we know them today as a result of digital transformation and disruption. No sector or industry is immune or future proofed from what’s about to follow. Traditional businesses and institutions are at risk of being displaced, becoming obsolete or made irrelevant. Listen to real-world examples of how some companies are evolving and transforming at an incredible rate fueled by management practices and technologies that didn’t even exist a short while ago. What if – you could deploy software 46 times faster? What if – you could recover 96 times faster from system downtime? What if – you could deploy changes with 80% less failures? This session is about how smart companies are deploying new business functionality in the digital age. Listen to real-world examples of how Lean CSI is used to salvage customer relations and reduce costs by enabling fast-safe-reliable Change Management to decrease failed changes leading to outages. Hear voice of customer to learn what they value most; define goals, objectives, outcomes and measurements of success. Use Kaizen methods with problem analysis to find your weakest links that matter most through root cause analysis. Identify issues, gaps, risks and waste that cause errors, drain your resources and clog-up your work flow. Develop a prioritized list of initiatives using Agile project management methods. Fast-track the implementation and adoption of organizational changes using the principles and power of DevOps based team. This session is about how to use proven Lean CSI method to deliver and optimize quality change management services to customers, identify waste and eliminate it, improve efficiency, speed of execution and the overall reliability of managing changes. Case study examples of using better asset data to improve service, reduce cost & mitigate risk. Smash the silo: make your key asset data available across the organization, at all times. In this section, we’ll talk a bit about how organizations often silo their support/ticketing systems off from other systems containing key asset data, and why this would matter and introduce potential waste and headaches for an organization. The hidden costs of a long refresh cycle: Here I discuss the relationship between aged assets and the spike this can cause in support traffic. A look at gaps that can be exposed by having things like asset age, supportability, and current maintenance coverage can help with a refresh strategy. Proper maintenance coverage: a shortcut to eased support overhead. Here I’ll talk through a handful of real-world examples where a lack of asset oversight led to actual outages or over-payment by customers we’ve worked with. Pitfalls of popular maintenance platforms: Discussing some of the ways in which gaps that cause support headaches are systemically introduced by popular maintenance programs such as SmartNET. We look to ITIL processes like Change, Release and Configuration Management to give us more control, insight and improved performance just find massive resistance to change. Time and again our IT improvementS eludes us because of ‘Resistance to change’. Join Paul Vos as he challenges your thinking by presenting proven Organizational Change (OCM) best practices and learn how to prevent false starts and change fatigue. Change does not have to be a frustrating tug of war, learn how to get change right in one go! Since IT is primarily “Knowledge Work” it’s critical we understand our productivity vs. the value we create. Time is the key factor in calculating productivity. It is also important to know what value-added vs. non-value activities consume our time. Leading organizations are tapping into a new Lean IT measurement model to better understand how to measure throughput, efficiency, effectiveness and quality of ITSM services. 1. What to measure for value creation, alignment and operational excellence. 2. Interpreting results. Many lack the skills and methods required to analyze metrics data to support corrective or preventative action. 3. Getting/trusting data. Underlying data collections systems are not designed to support analytical methods required for management decision making and/or are not trustworthy. This session is about how savvy IT managers are implementing a new Lean IT monitoring and metrics and ITSM. Monitoring tools have always been there. Other sources also provide useful information to calculate availability and performance of IT Services. However, not always that data contributes to provide real insight of the health of IT Services and their impact in business. This session presents new trends in the monitoring, aggregation and automation of service availability, service capacity and service level monitoring, aligned with ISO 20000 requirements and ITIL best practices. What’s the new digital business model used by leading organizations? Leading organizations are tapping into a new IT model for extremely fast concept-to-cash or low time-to-market, andmuch lower operating and capital expenditures vs. being replaced by a startup or an App. Imagine up to 200 times faster software deployment, 30 times increased deployment frequency, and 60 times higher change success rates. The data doesn’t lie. Organizations such as Netflix, Spotify and Facebook are transforming IT by successfully implementing DevOps principles. You don't have to be a hot internet company or a gigantic enterprise to be a DevOps leader. Companies large and small, young and old, have magnificently made the transition and have the proof of success in their pockets. This session is about how savvy IT managers are implementing a new digital business model to run IT like a business. How does the role of the process owner evolve when using a lean approach to management? What are the skills and experiences that a lean process owner should have? How does the process owner role relate to other roles, such as IT management, process managers and process practitioners? What are the pitfalls that you might experience in identifying and developing the process owner? This session looks at the trials and tribulations of an IT organization as it attempts to find its way in making continual improvement part of its culture. What are the patterns seen in the “traditional” approach to the process owner role? How is a lean approach different? What are the aspects of an organization’s culture that impact the success—or failure— of the role? How can we motivate the process owner? DevOps is the marriage between Agile, Lean and IT Service Management (ITSM). To begin your journey and be successful you need to adopt and adapt from all 3 movements. DevOps is best defined as the capability to cooperate, collaborate, communicate and continuously improve how an organisation uses and benefits from technology to satisfy the goals of a customer or help them remove a problem. •What are these 3 movements? •How they get you to begin a DevOps journey? •Tips on the journey of idea to realisation? If you are thinking of how to benefit further from Agile, looking to remove the complexities of your ITSM processes or want to understand why lean is important to your success; listen to this interactive session.